Yet some people are frightened to acknowledge our disgraceful past. What is so offensive about saying sorry? A Sydney public school performance that portrayed Aboriginal children being taken from their families has outraged a few people. It's a wonderful thing that children are learning about the Stolen Generation. In my day, at school in the 1980s, we were taught that Captain Cook discovered Australia. In fact, we spent more time learning about Nazi Germany and the Holocaust and many schools kept us only partly informed about our own history. But I am from a different generation and I'm happy that we've come a long way when it comes to correcting our history lessons. Forestville Public School, in Sydney's Northern Beaches, where my youngest son attends school, recently put on a production called 'Australia You're Standing In It'. The majority of the concert was all about fun and celebrating Aussie icons; from Steve Irwin to Louis the Fly. But the last 10 minutes of the performance, featuring the Year Six kids, tackled the difficult topic of the Stolen Generation. It's history. It happened. We need to face up to it. I'd like to thank the school for a wonderful production and also giving parents, like me, who knew nothing about the Stolen Generation when I was a student, a feeling of relief that today's generation of Australian kids are finally being told the truth. Yet some people are frightened to acknowledge our disgraceful past. Indeed, a small group of disgruntled parents approached the media, complaining that kids 'abused each other onstage' in front of kindergarten kids. To say they made a mountain out of a molehill is putting it very mildly. Those that called a breakfast radio show made it sound like the kids were whipping each other onstage when no child touched another child. So please allow me to set a few things straight because I was there. I've even got the 'video evidence'. The kindergarten kids were dressed as penguins and had nothing to do with the Stolen Generation sketch at the end of the concert. To the person who complained that kids dressed as nuns 'abused children on stage,' this did not happen. I saw one girl dressed as a nun leading a child offstage. There are accusations that the school used the kids as 'political pawns'. These are hard working teachers trying to educate children that the Stolen Generation existed and still live with the scars and mental anguish of being taken from their families. There was no political agenda. It is our history. Like it or not -- it happened. 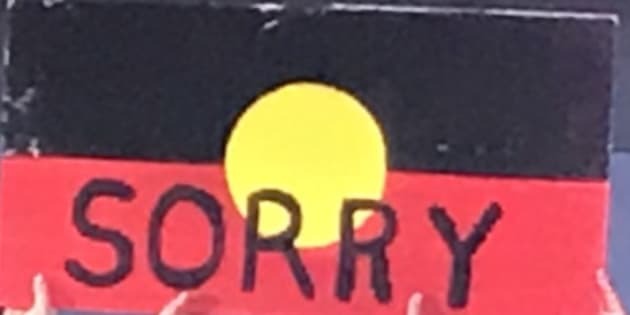 Some people also complained that, for the finale, the kids were holding large signs featuring the colours of the aboriginal flag with the word SORRY. What is so offensive about saying sorry? It's just one word, packed with so much emotion it had MOST people in the audience in tears. If you are offended about a group of school kids saying SORRY for the Stolen Generation then I feel sorry for you. Above all, the production was beautifully written and it stuck to the facts. But, as we all know, you cannot please everybody. A friend of mine who works as a nurse told me 'People will complain about anything. Somebody complained at the hospital that I didn't make them a very good cup of tea. Oh well."